JEJU ISLAND ― Shooting once-in-a-life-time photos from enviable locations ― mainly for social media ― has become an increasingly popular fad in recent years, regardless of age. Taking the trend into account, the Korea Tourism Organization's (KTO) Jeju branch has come up with 40 "instagrammable" spots on the resort island that will ensure gorgeous pictures even if you are not a photography whiz. Plus, on the occasion of the 2019 Spring Travel Week from April 27 to May 12, the branch plans to hold two photo events that it believes will give visitors a great photography tour. Here are some destinations for vacation-photography experiences around the southern island of Jeju. When you arrive at Jeju International Airport, Dodu Rainbow Coastal Road can be the first stop of your photography tour because it is close to the airport. The rainbow-colored barriers running along the ocean offer a scenic view mixing with the seashore, so it is an up-and-coming photo spot for social network media freaks. The length of the barriers is 15 to 20 minutes on foot, providing an ideal place for a stroll. 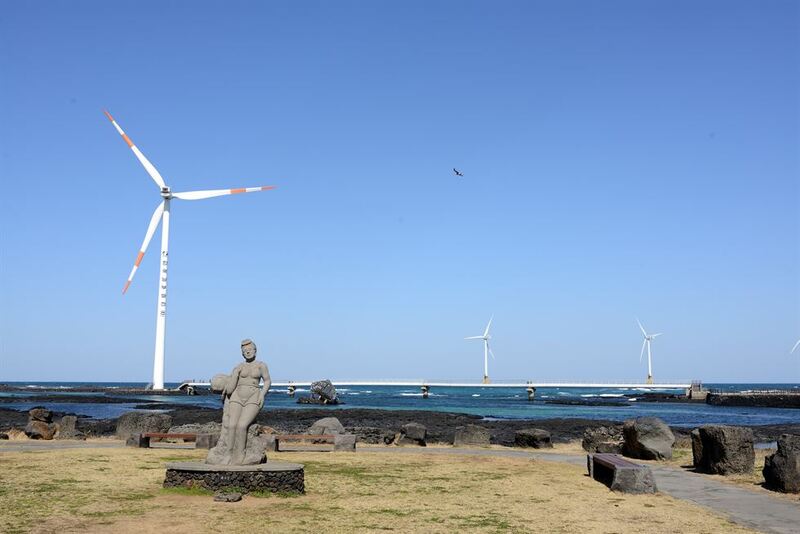 Sinchang is known as having the strongest winds on Jeju Island. For that reason, a wind power plant was established in 2007, resulting in huge windmills built in the ocean that present beautiful and romantic scenery. Near the plant, there is a park along with a footpath featuring a sea-crossing bridge and an observation deck that often appears in commercials and TV dramas, which means it can be a great photo spot. Also, the road on the northwest side of Jeju Island is one of the best venues to see the sunset, drawing many tourists. Bagumji Oreum is 1 kilometer west of Mount Sanbang in the southwest corner of the island. Resembling a bat spreading its wings, the volcanic cone only stands 158 meters tall, but the height is not really indicative of how hard it is to climb. The track to the pinnacle via many staircases is quite steep, leaving climbers gasping for air. However, when making it to the top, your pain is rewarded with jaw-dropping panoramic views of Mounts Sanbang and Songak and Hyeongje (Brother) Island. 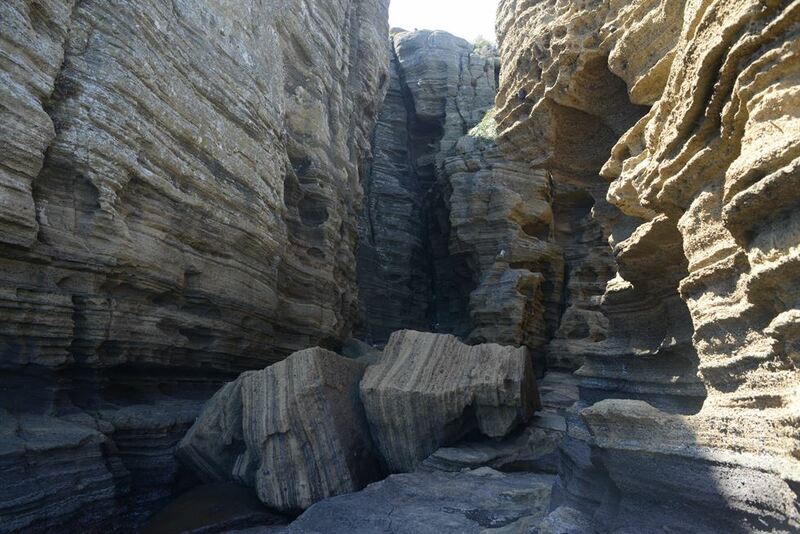 Dubbed as Jeju's own Grand Canyon, Yongmeori Beach, the oldest volcanic area on the island, shows off wide rocks stacked up on one another along the seashore cliffs which create majestic scenery by the sea. Along the road down to the seashore, there is the Hamel Castaway Memorial in remembrance of Hendrik Hamel, a Dutch sailor who drifted to this place in 1653. Just off to the right of the beach is a soft and dark sandy beach. You can meet the women sea-divers of Jeju, called "haenyeo," who sell sea cucumbers, and stroll on the road that runs along the seashore. The lesser-known Eongdeongmul Valley is a hidden gem in the Jungmun Tourist Complex, where visitors can stroll through the yellow canola field. 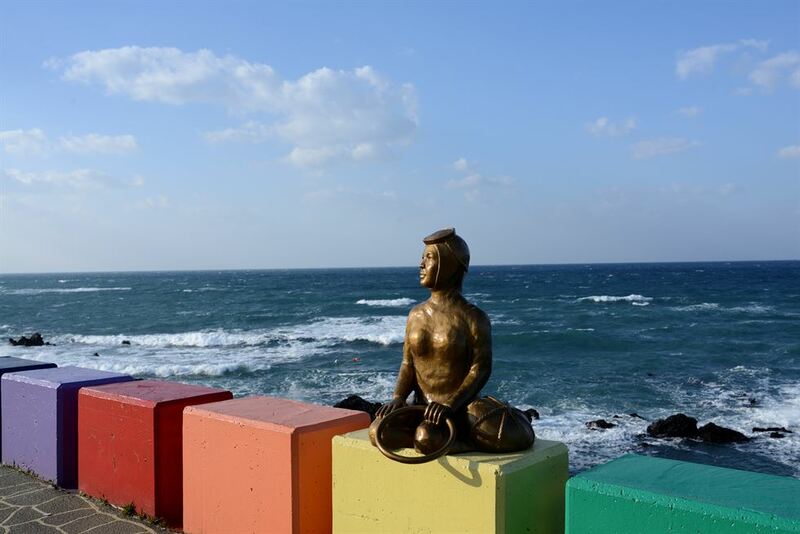 It is located east of the Lotte Hotel Jeju. It is on Course No. 8 of the Jeju Olle Trail. Meochewat Forest Trail is located in the mid-mountainous area between 200 meters and 600 meters above sea level, southeast of Saryeoni Oreum. There are two footpaths ― one spanning 6.7 kilometers and the other, 6.3 kilometers ― with both taking about two-and-a-half hours. Upon hitting the road, you can come across a canola field and it also features a ranch road, a Hinoki cypress road and a forest tunnel. Plus, an eco-party program will run during the travel week from April 29 to May 3, which will feature eco-trekking, a footbath and a local food event. There are a slew of spots to see canola flowers, but Gasiri Village might be the best place on the island. The yellow waves of flowers dying vast grassland, and windmills standing between the flowers make for a pastoral view. Noksan-ro, across the village boasts the rare combination of cherry blossom and canola flower, assuring visitors of colorful pictures. During the travel week, the Jeju KTO branch will run a program in which tourists can visit these photo spots with a professional photographer who will teach them basic photography skills and take photos of them. Those who are interested in the program can apply at travelweek.visitkorea.or.kr until May 9. The application will be on a first come, first served basis.